It took subcontractors three years to remove the contaminated radioactive materials from the site, a former nuclear research and depleted uranium weapons facility. 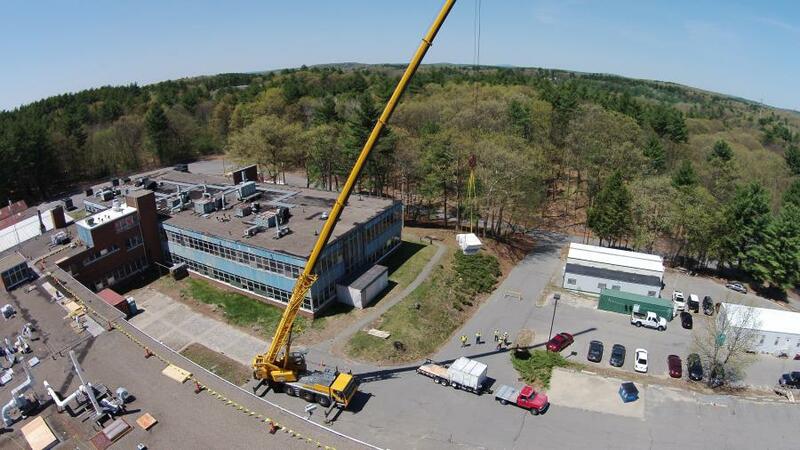 A key phase of the clean up of Starmet Corporation, a superfund site in Concord, Mass., was recently completed by de maximis inc. The main work was finished last August — under budget by $15 million. It took subcontractors three years to remove the contaminated radioactive materials from the site, a former nuclear research and depleted uranium weapons facility. The buildings were demolished over a five-month period. •	long-term monitoring and institutional controls. 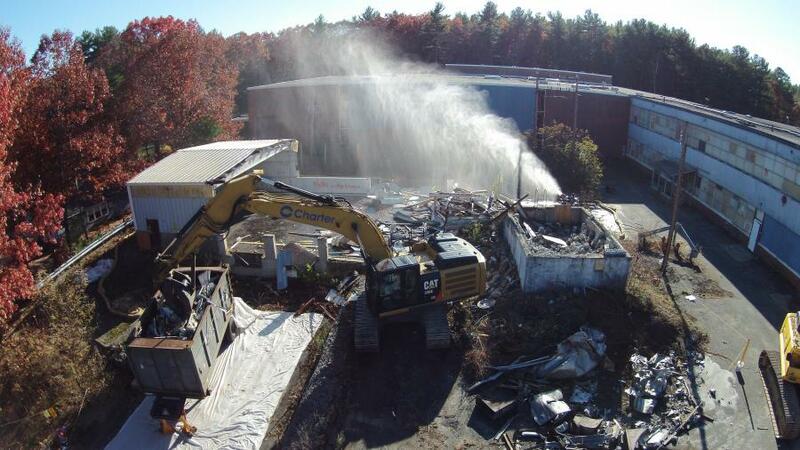 This $55 million demolition project required specialized work and safety precautions. The site included a two-story, five-section interconnected building; a hydrogen peroxide tank house; two gas cylinder storage huts; and four metal storage buildings, which had a combined footprint of approximately 185,000-sq.-ft. (17,187 sq m). In 1958, the site — an off-shoot of the Manhattan Project — had contracts with the United States Atomic Energy Commission and Department of Defense, along with some private industry contracts. These operations included the investigation and development of materials for missiles, airframes and other components. Stan Baker, de maximis's site construction manager, said that the mix of contaminants, which included DU, beryllium, PCBs and asbestos, mandated both body coverings and respiratory protection. When inside, workers used reciprocating sawzaws with metal blades for the internal demolition. The sawzaws were disposed of due to contamination, as was much of the equipment used on the clean-up. The containers used for the debris were tarped and shipped by truck to New Jersey and then sent by rail to Idaho. The containers were brought inside buildings and loaded. Roll-up doors minimized the chance of debris and dust being released. The fleet included forklifts from Doosan, Ingersoll Rand and Toyota; Crown electric pallet jacks; and various portable equipment. Crews gathered material room-by-room, with sawzaws being used to cut desks and filing cabinets into smaller pieces. There were also rooms stacked floor-to-ceiling with old computer monitors that were partially contaminated. A small Volvo EC160B excavator with a grapple attachment was purchased to help with the removal of material. “There were hundreds of containers of acids, greases, oils, and an incredible variety of chemicals and contaminants to deal with,” said Thompson, “so inventorying and neutralizing and stabilizing them for shipment was crucial. Removing them took three years. We started with the high hazard waste first — chemicals and combustibles — to reduce the risk of working inside. 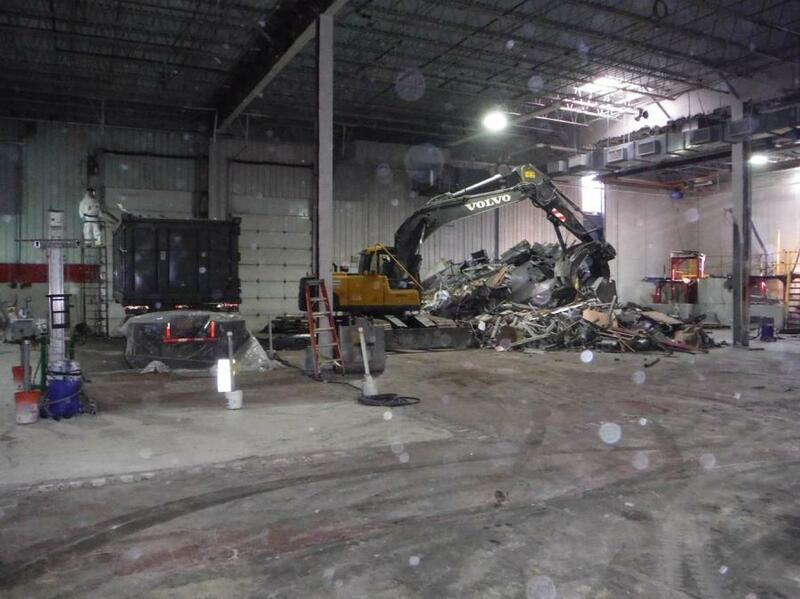 The second phase was to remove the equipment and manufacturing items — there was an 80 by 40 ft. (24 by 12 m) room full of contaminated lathes and milling machines that had to be deconstructed. With the buildings emptied, all flat surfaces throughout the interiors were HEPA vacuumed and then sprayed with a lockdown agent, similar to latex paint, to have the contaminated materials adhere to the building structures. The vast majority of the equipment for the interior work was disposed of, but the excavator, and some of the forklifts and manlifts were decontaminated, verified clean and recovered for further use. The disposed of equipment, including scissor lifts, had their batteries drained and fluids removed. “That we got some of it out was a bonus,” said Thompson. The EPA was the lead regulatory agency, and the Massachusetts Department of Environmental Protection (MassDEP) also participated. 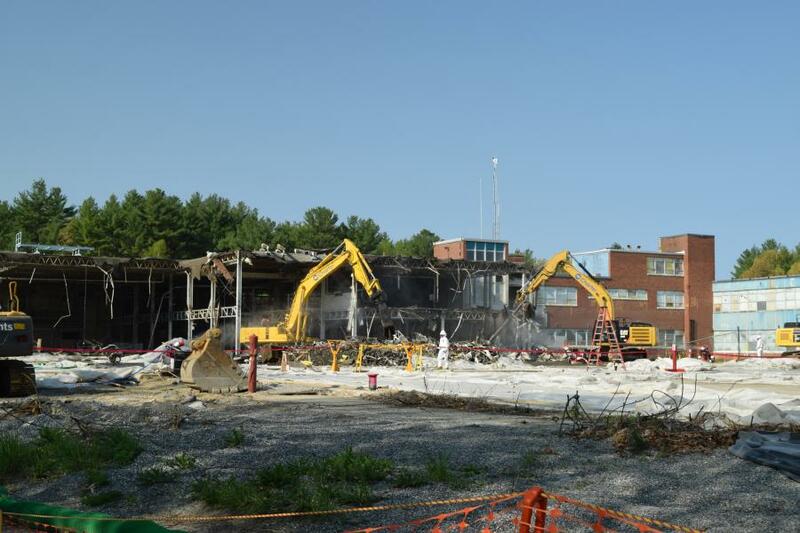 de maximis prepared and submitted clean-up and demolition work plans to the EPA and MassDEP for review and approval. The EPA required the monitoring for the air around the work zones to ensure that concentrations of contaminants did not exceed regulations. 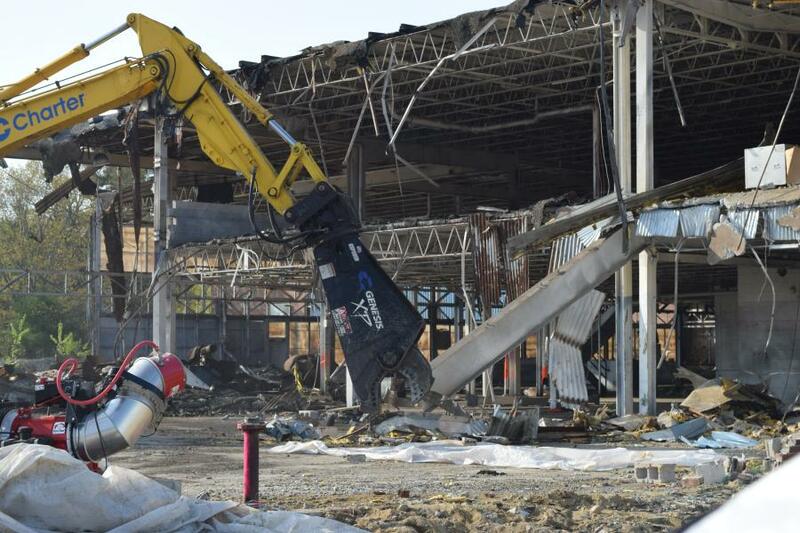 For the demolition, Charter Contracting Company LLC used Komatsu PC300 and Cat 336 excavators; Genesis GXP shear; grapple; Monsoon Mister misting machines; and manlifts. “The buildings were demolished from the top down in a controlled manner to reduce the generation and potential spread of contaminated particulates,” said Mike Wagner, Charter's project manager. “The excavator was used to grasp the steel structure and the shear used to cut the building members. The debris was then lowered to the concrete slab. All the debris was then sized using the shear to allow loading for offsite transport and disposal. “Dust control was extremely important for this project due to the contamination known to be in the building,” he added. “Dust was controlled using multiple misting machines which produce small water droplets which knock down the dust caused during site activities. The final site clean-up is under negotiation and is expected to cost at least $125 million and start in five years. For Baker, the challenge was working in a nuclear regulatory environment.